Today there is an app for almost everything. From advanced mathematics to racing games, the diversity of mobile apps is truly amazing. However, there has yet to be an app where restaurant owners can charge their patrons directly on their phone resulting in the necessity of written receipts. OpenTable, the popular real-time restaurant reservation service, is aiming to eliminate the seemingly ancient tradition of putting pen to paper to pay for food stuffs with the wide expansion of their mobile payments app. The company originally announced in February 2014 they were unveiling the feature for use at a few select restaurants in San Francisco but have now revealed they are adding an additional 20 cities before the year is over. 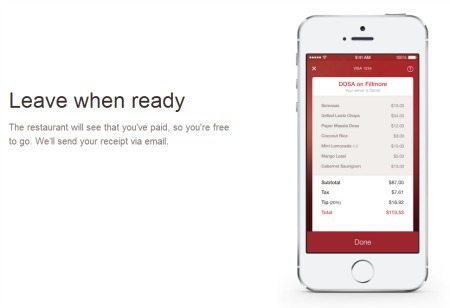 When using the feature, customers receive their itemized receipt on their app and simply swipe right to pay. Currently, the feature is only available in New York and San Francisco.